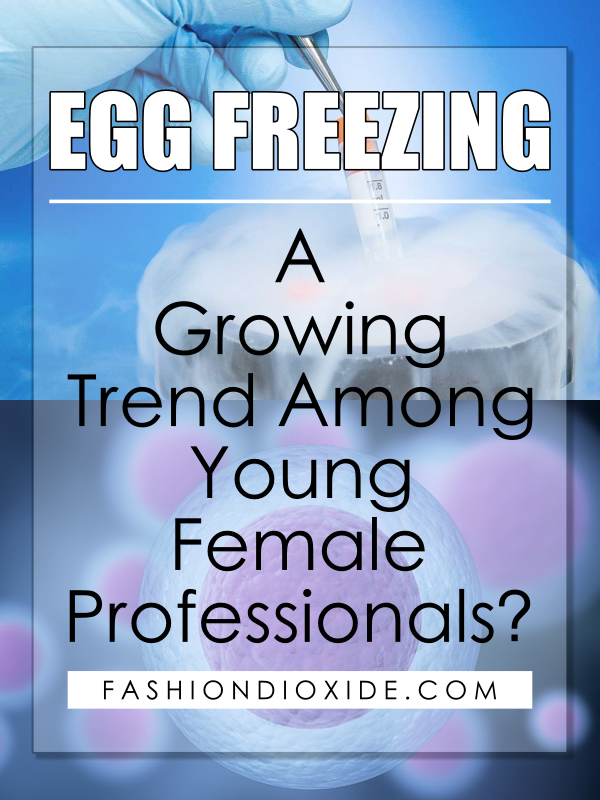 Egg Freezing: A Growing Trend Among Young Female Professionals? Nowadays, when you hear people talking about egg freezing you can’t just assume that they’re referring to chickens. It’s much more likely they’re discussing reproduction and some of the options women now have before them in this regard. Egg freezing, or human oocyte cryopreservation, is a process where a woman freezes her eggs to be fertilized at a later date. Seems pretty self-explanatory, right? Well maybe, but it isn’t. While sperm and embryos are relatively easy to freeze, the egg is not. As the largest cell in the human body, it holds a high concentration of water when compared to other cells. This makes the egg more difficult to freeze because the ice crystals can potentially damage it. Studies have shown that dehydration of the egg and using an “anti-freeze” alternative will prevent some of the issues surrounding freezing cells with such high-water content. The shell of the egg hardens when frozen, which means sperm must penetrate the egg in a different way. Doctors use a technique called Intracytoplasmic Sperm Injection (ICSI) which injects sperm directly inside of the egg. They are then frozen using a flash-freezing process called vitrification. The entire process leading to the eggs being frozen takes approximately three weeks. A period where the woman takes birth control pills and receives hormone injections in order to properly prepare the eggs. If she will be receiving medication for an illness, she will skip this step. Once the eggs have ripened, a needle is used to remove them from the uterus, a process that requires anesthesia. Afterward, the eggs are frozen. When a woman wants to use these eggs, they are first unfrozen and injected with sperm, then relocated to the uterus as embryos. Most eggs are frozen at an average temperature of -196 degrees Celsius. Eggs can be frozen for many years. Doctors say that for best results a woman should freeze ten eggs for every pregnancy attempt. On average, seven eggs are successfully thawed and five or six eggs of those are suitable to be fertilized. Why would you want to do it? When a woman freezes her eggs there is less pressure on her to settle down right away and have kids. A lot of people have goals that would be much easier if they didn’t have children. These women may or may not choose to have children later on, but by preserving their eggs they no longer have to worry about someday being unable to conceive. The quality of eggs drops after age 32 and decrease even more radically after age 37, creating a higher risk of chromosomal abnormalities and miscarriage. If you freeze your eggs at a relatively young age their quality should not diminish over time. Every woman is born with a finite number of eggs, which declines as she ages. Pregnancy rates are most favorable for women in their early 20s. Statistics show they experience average pregnancy rates of 25 percent each month. Women in their 30s have pregnancy rates that decline to 15 percent each month and then five percent as they reach their 40s. 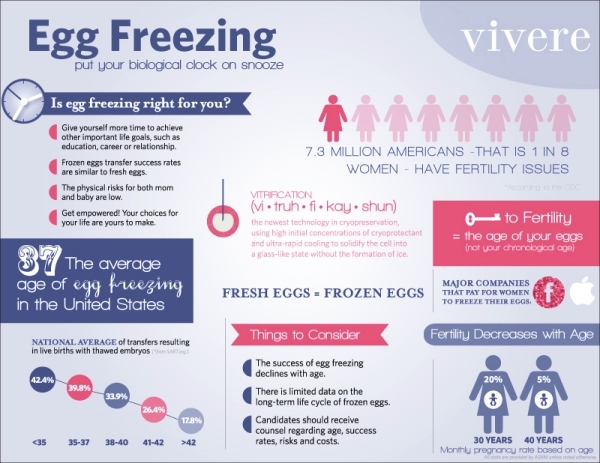 There are numerous facilities around the world that provide egg freezing services. If you’re battling cancer or another illness that could affect future pregnancies, freezing your eggs will allow you to become pregnant later on, after the illness has been successfully treated, better ensuring the safety of your child. One of the things to keep in mind is that the entire process is rather expensive, costing approximately $15,000, which includes fertilizing the eggs once the woman is ready for pregnancy. While there are a growing number of more affordable options, it should definitely be considered a major investment. 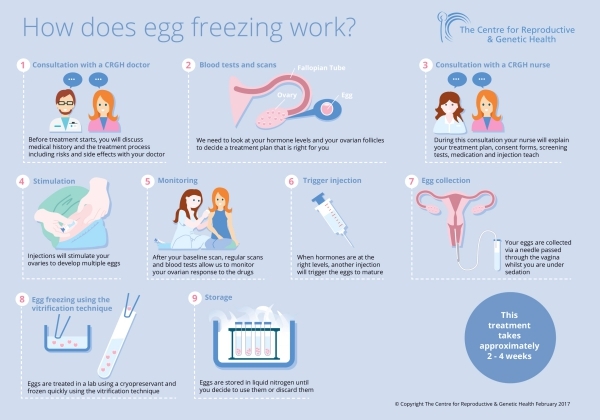 Freezing your eggs does not ensure you will produce a baby. With time, there is an increased risk of developing health issues that negatively affect pregnancy, like high blood pressure or diabetes. Plus, it’s possible the sperm injected inside the egg may not work for egg penetration. This can also lead to a false sense of hope. If you’ve been trying to conceive with no success, freezing your eggs may seem like the solution to your dilemma. Unfortunately, just like other forms of conception, there’s no guarantee you will become pregnant. The emotional stress and trauma of not having your frozen eggs result in the birth of a child can be absolutely devastating for some people. Many people never end up using their frozen eggs because they reproduced naturally with no need for their stored eggs. This can be painful when you stop to consider the thousands of dollars you wound up flushing down the drain unnecessarily. In spite of the cons stated above, egg freezing has shown itself to be a great way for women to reproduce successfully. As research into the practice continues to produce better techniques and word spreads about the possibilities egg freezing represents, the number of women pursuing oocyte cryopreservation has grown exponentially. If it sounds like something you’d like to look into for yourself, your gynecologist should be able to provide you with more details about the procedure.